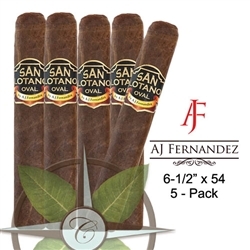 The San Lotano Oval by AJ Fernandez is a Nicaraguan made cigar that offers medium strength, medium-full flavor, and great complexity. The four year aged Habano 2000 wrapper sets the richness and structure of the blend. The Ncaraguan, Honduran, and undisclosed AJ Fernandez Select filler are bound by a Nicaraguan leaf that adds even more richness to this oval shaped cigar. AJ Fernandez has made a reputation off of blends like this. Smoke and you too will understand why his skills as a blender and cigar maker are so respected. Also, don't be put off by the 54 ring on this Toro. The oval shape makes it as pleasant to smoke as a fully box-pressed shape.